What the Crop? ← You Want Me To Wear What? Oh man. This is a whole lot of look. 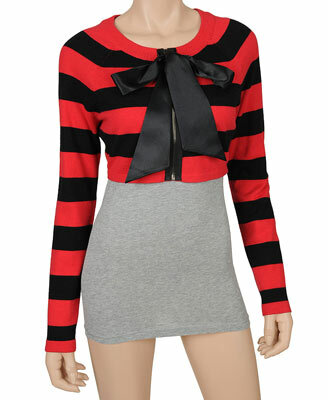 A striped, cropped sweater with a giant bow? Did it need all three components? I mean, it fits eight stripes on the torso. That means the stripes are far too thick. It kind of defeats the purpose of including stripes in the first place. If they were so set on stripes, they could have at the very least gone with a full-length sweater. And that’s not even dealing with the giant bow. I can’t think of a purpose for that one, unless it’s because you’re not getting enough food on your shirt without having dangling strips of fabric at food-on-table height.